Glasgow’s biggest weekly club night of the ‘90s makes a triumphant return this Saturday night at the Keller Club in Glasgow’s Queen Street. Running from the early-90s until the early-noughties, Saturday nights in Glasgow were ruled by one weekly club night - Triumph at the Tunnel Club in Glasgow. 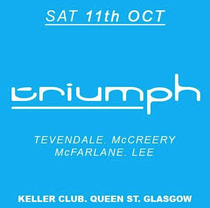 Now, for the first time in over a decade, its residents - Colin Tevendale, Steven McCreery, Kevin McFarlane and Stephen Lee - reunite for special night of musical memories, when trance and progressive dance music took you on a euphoric journey, and soulful and funky house music embraced you in its spiritual feeling. The foursome have played once together, about eight years ago at a night which featured various other guest DJs, but this is the first time in over ten years that the original Triumph team have came together to perform in their original styles. Back in the ‘90s, the Tunnel Club in Glasgow ruled the city as a weekly club night. The Arches had its fantastic monthly parties, but the Tunnel was the place to go every Thursday with its huge student night, every Friday for its legendary Ark night and then the madness continued with its weekly roadblocked Triumph Saturdays. Its main room hosted Colin Tevendale and Steven McCreery, playing the latest trance and progressive music, with regular support from DJs such as Tiesto and Ferry Corsten. Room two was where the funk was as residents Kevin McFarlane and Stephen Lee dropped the best in US and European soul and disco house. The mix of styles in both rooms was perfection, attracting over 1500 clubbers from across the UK every Saturday night. Now the club night reunites at one of Glasgow’s newest, cooler venues, the Keller Club, a venue that’s already starting to make an impact in the city’s over-crowded club and bar scene with its regular parties featuring the best new talent, mixed in with nights dedicated to the brands and DJs from a previous decade. The night will be hosted by the man behind Ultrasonic, Mallorca Lee. Now a successful DJ/producer in his own right, it was Mallorca’s vision that brought the night together. With just five days to go, the hype for the night is reaching fever pitch with online support from former clubbers reminding you just how good the music used to be. With tickets expected to sell out prior to the night, you can find out the latest information via the night’s Facebook event page here.